The James River is the southernmost major tributary of the Chesapeake Bay, offering a wide range of recreational experiences. Flowing from the west, the James passes through Richmond and joins the Bay near Norfolk, not far from the Atlantic Ocean. With abundant natural fisheries and "breadbasket" marshes, the James River at the time of Captain John Smith's voyages supported eleven Algonquian-speaking groups, with some population estimates as high as 20,000. In May of 1607, the English arrived at a point up the river beyond Hog Island and established the first permanent English settlement: Jamestown. A hastily built palisade protected the English from both Spanish and Powhatan attacks. Four yeas later, another group of English colonists settled along the historic James River at Henricus. Under the sponsorship of many organizations, activities along the James include: photography, fishing, whitewater kayaking classes, ecology field trips, music and art festivals, clean-ups, canal cruises, guided nature trips, Civil War history programs, sunset river tours, James River Batteau Festival, river camp for children, eagle and heron observation, wheelchair birding, and family rafting. 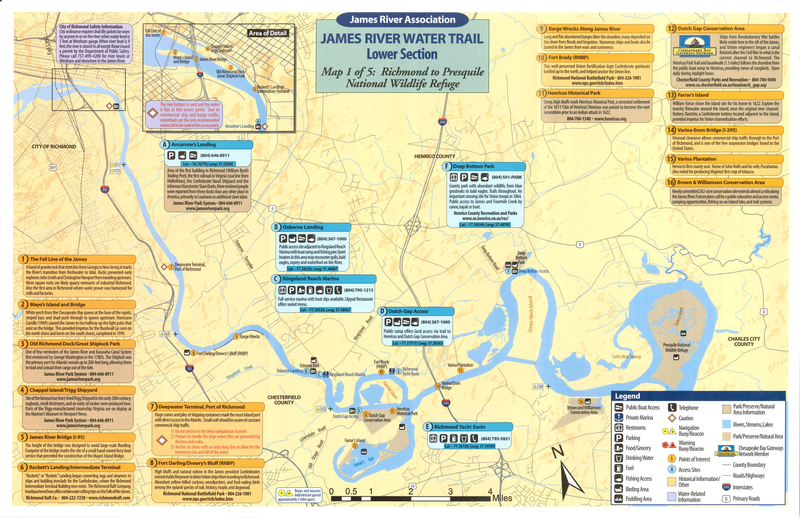 The Lower James River Water Trail extends from the City of Richmond to the mouth of the James River in Hampton Roads with many public access points on both sides of the river.